Founded in 1961 by the late Rabbi Joseph Kelman, The Kadima Centre offered Jewish children and teenagers the opportunity to attend an accredited Hebrew and religious school program-- a revolutionary initative that was the first of its kind anywhere in North America. Proudly hosted by Beth Emeth Bais Yehuda for some 50+ years, The Kadima Centre was conceived by Rabbi Kelman as a community-based program. It relies on outreach funding from the community to fulfill its prime directive of full inclusion. The Kadima centre has evolved to provide Jewish adults with special needs & exceptionalities weekly social, recreational and educational programming with a Jewish flavour. Jewish spirituality is conveyed through music, dance and a curriculum which covers all the Jewish holidays and how each is celebrated and observed, both in the home and synagogue. Talmudic lore and Jewish tradition are integrated into programming that is fun, interactive and emphasizes our connection as a people with Israel. Jewish tradition has always championed the causes of those who need help the most. 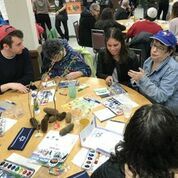 At The Kadima Centre, our philosophy is to provide programming designed to engage and appeal to a wide array of Jewish adults with exceptionalities and help each to fulfill his/her personal potential. Programs are held on Sunday afternoons, unless otherwise notified. Examples of past programs are trips to the Royal Ontario Museum, apple picking for Rosh Hashanah, arts and crafts to decorate the Sukkah, bowling or floor hockey, baking or cooking, concerts or sing-alongs, just to name a few! We also participate in community activities like the UJA Walk with Israel! Our participants range in age from their 30s to their 70s. Some live in group homes, others with parents and caregivers and others live independently. All share a desire to actively participate in 90 minutes of interactive fun designed to stimulate the mind, channel creative energy, and provide camaraderie in a warm environment with other participants. We always welcome new participants! If you or someone you know is interested please contact the Synagogue office at 416 633 3838. Volunteers are always welcome to assist with programs and outings. Volunteering with us is an excellent and rewarding way for high school students to learn about volunteerism and working with different populations while completing their requirements for community service. If you are interested in volunteering please contact the Synagogue office at 416 633 3838. Please click to read this recent blog — all about the Kadima Centre participants and their special gift to Reena here. Please click here to download the The Kadima Centre brochure.